When Will Ryan Lochte’s Teammates Return To America? Brazil Says The Swimmers "Told One Lie After Another"
According to Ryan Lochte, the U.S. gold medalist swimmer, he and three other Team USA swimmers were robbed at gunpoint early Sunday morning on their way back from a party at the French Olympic team's hospitality house. In his version of events, the taxi he and his three teammates were riding in was stopped by robbers posing as police who pointed a gun to his head and stole his wallet. Now, Brazilian authorities are questioning his story, calling it an outright fabrication, and have pulled two of his teammates off their plane home. So when will Lochte's teammates return to the United States? Also wanted for questioning are Lochte and James Feigen, the other teammate who has given a statement about the alleged robbery. Lochte and Feigen's passports were ordered seized to prevent them from leaving too. Police even went to the Olympic Village Wednesday to take them in for additional questioning, but U.S. swimming had already moved out. Feigen is believed to be in Brazil, but Lochte has already returned to the United States on Monday. 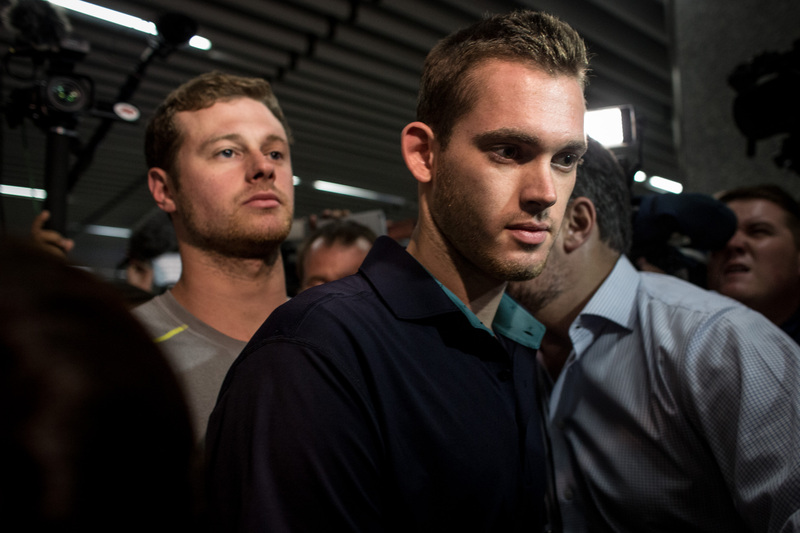 Jack Conger and Gunnar Bentz were detained Wednesday night shortly before their flight was scheduled to depart from Rio. They were released by local authorities with the understanding that they would continue their discussions about the incident on Thursday. James Feigen is also communicating with local authorities and intends to make further statements regarding the incident on Thursday as well. We will continue to provide updated information as it is appropriate. Speaking with NBC's Matt Lauer on Wednesday, Lochte stuck by his story, although some of his details changed. Most recently, he said that the gunman pointed the gun in his general direction but did not place the gun to his head. He also said that the four were robbed when they had stopped at a gas station to use the bathroom. On Sunday on NBC's Today, he said that they were "pulled over" and that with regards to the gun, the assailant "put it to [his] forehead." Brazilian judge Keyla Blank, who ordered the swimmers to remain in country, said in ruling that her decision is based on inconsistencies in their story. The times they said they left the party and arrived at the Olympic Village do not match security footage, and she wrote that "what can be deduced from seeing the images on the Olympic Village security cameras is that the supposed victims arrived with their physical and psychological integrity unshaken, even making jokes with each other, denoting that there was not any psychological disturbance inherent to the supposed violence they allege." If they were to be charged with filing a police report, the athletes could face six months detention or a fine. The investigation is a sensitive one, and many Brazilians are defensive of the capital, where security was massively stepped up before the Games. For the athletes, though, this is not the ideal end to their time in Rio.